Born in Nikolaev (Ukraine) in 1911. 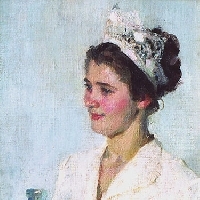 Studied at Nikolaev Art Technikum 1930-33. 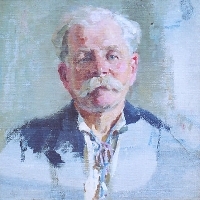 Began exhibiting in 1937. Important shows include: "All-Union Art Exhibition", Moscow, 1950; "All-Union Art Exhibition, Moscow 1951; "All-Union Art Exhibition, Moscow 1952; "All-Union Art Exhibition, Moscow 1955. Specialized in portraits, gebre paintings. 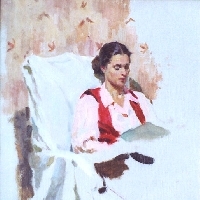 Well-known works include "Svetlana Shipunova, an Outstanding Student" (1950, Kiev Museum of Ukrainian Art); "A Nurse", 1955, Kiev Museum of Ukrainian Art, "My Thoughts", 1959-60, Kiev Museum of Ukrainian Art. Became a Soviet academician 1958. Awarded title "People's Artist of the USSR" 1963. Leading Ukrainian realist. Active in Odessa, Ukraine.